Years ago eBay purchased global classifieds giant Kijiji. It did operate as Kijiji for a while until eBay finally (and slowly) changed it to ebayclassifieds.com. Today, we received emails from eBay Classifieds that it will be shutdown shortly, I will assume that it’s because of the low traffic they have had since they made the switch. eBay also had purchased mobile local trading app Close5 about a year or so ago and it looks like it’s gaining momentum in the ranks of local trading apps market. eBay is pushing Close5 to be “The” replacement of eBay classifieds as you can read in the email screenshot above. About Close5: We have personally used it last year before our big move and were successful selling a few items we needed to get rid of, however other more popular local selling apps like Wallapop and OfferUp gave us better results. 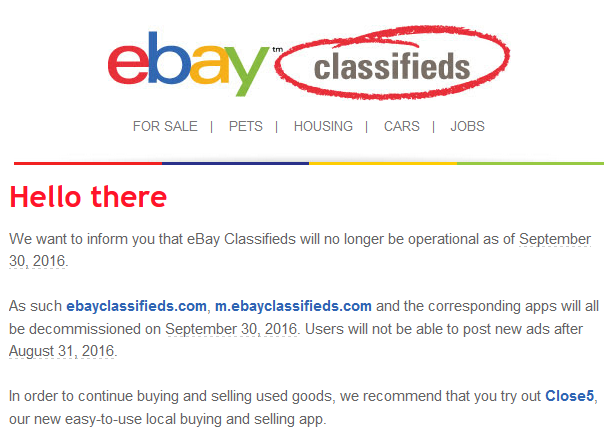 eBay Classifieds will stop accepting new postings by the end of August and will completely shutdown by September 30th 2016. While most Americans are just beginning to think about Thanksgiving, I know that, for you, the holiday season has been in full swing for some time now. From checking inventory to promoting products and sorting out shipping logistics, there’s a lot that goes into meeting demand during the holidays. For you — and all of America’s online sellers – it’s crunch time. And I’m sure the realities of the 21st century economy are making this season both more exciting—and more stressful. Demand has gone global. The majority of you have customers in foreign countries – and that’s not surprising. Today, 95 percent of the world’s consumers live outside our borders—and it’s our small business owners who are often the first to reach them. In fact, 98 percent of those who sell American goods and services abroad are small and medium-sized business owners. They’re sellers like Rebecca Germain, an international entrepreneur turned stay-at-home mom who used her business savvy and the freedom an open Internet provides to sell scrapbooking crafts on eBay. Or Nick Martin, a Wisconsin native who traded living out of his van for running a successful eBay business that continues to grow because of his ability to reach customers around the globe. It’s businesses like yours that helped us sell a record-breaking $2.34 trillion in exports around the world last year, which supported nearly 12 million jobs here at home. However, while many on eBay are selling abroad, fewer than 5 percent of American small businesses are selling their products in foreign markets—and most who do export only sell to one country. That’s got to change. If America is going to continue to lead, we have to make it easier for entrepreneurs like you to sell what you proudly make here in some of the fastest-growing markets around the world. 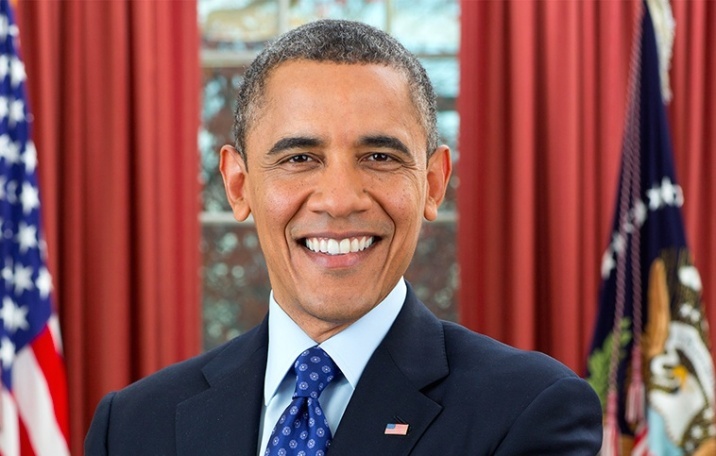 That’s why my team spent five years negotiating the Trans-Pacific Partnership, a new trade agreement that levels the playing field for you and your employees, bringing down trade barriers like high taxes and red tape, while preserving free and open digital data flows between you and your customers in the Asia-Pacific. You can read the full text of the deal right here. With a chapter dedicated to e-commerce, TPP establishes rules for digital trade that will protect and empower online businesses in the global market. Under this agreement, companies and consumers can access and move data freely without facing arbitrary blocking of websites. Companies won’t have to build expensive and unnecessarily redundant data infrastructure in every market just because they want to sell there. Hate all the paperwork that accompanies doing global business today? TPP also promotes paperless trading—transitioning customs forms from paper to electronic format and providing for electronic authentication and signatures for consumer transactions. This is also the first trade agreement ever to include a whole chapter dedicated to small business, addressing the chief obstacles so many business owners like you face in the global economy. Whether it’s burdensome customs regulations, the lack of efficient express delivery services or secure online payment options, differing regulatory regimes in foreign markets, or the slow delivery of small shipments, the TPP seeks to fix these issues by eliminating 18,000 taxes that various countries place on Made-in-America products, streamlining standards and technical regulations, strengthening intellectual property rights to fight counterfeiting and theft of your creative work, and more. You can read these chapters and the rest of the TPP text here. If you do, I’m confident you’ll see why this trade deal will level the playing field for entrepreneurs like you and open up opportunity to expand in some of the fastest-growing markets in the world. After all, small business—the business you’re doing right here on this platform—is propelling the American economy and our global economy forward. And the fact is that this deal can significantly impact the way you work and run your business. So when you’re taking a look at the TPP, I hope you’ll take the time to dig into the details and see exactly how much it stands to help you and small business owners like you across the country. Read the complete text right here. Thank you – and happy selling. How I Made $1600 Overnight Literally While Sleeping! 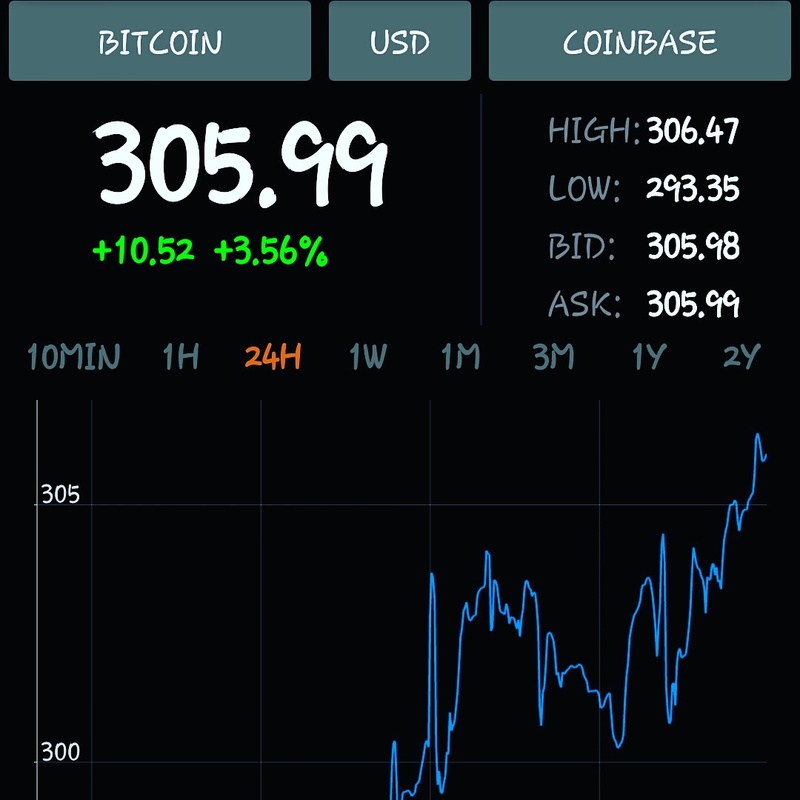 I promised to write about Bitcoin a little, in the past 24 hours Bitcoin’s price jumped to as high as $306, it’s not a secret that I trade Bitcoin almost on a daily basis, trading Bitcoin and other cryptocurrencies is one of the methods I have my Bitcoin business built upon. Online Bitcoin trading is easy and in my opinion “predictable”. As soon as I say the price jump on my phone, I sold the difference ($10.54) of all my Bitcoins, after the fees and the sale, my peofit was close to $1600. That’s literally someone’s paycheck for a month. I’m re-investing this profit tonight since the price is down to $301. That’s an extra 5+ bitcoins with some cash leftover (enough for a nice dinner). Although I’m about to launch my eBay course, I’m thinking of another course to follow, would you be interested in a cryptocurrency course? Let me know in the comments below.